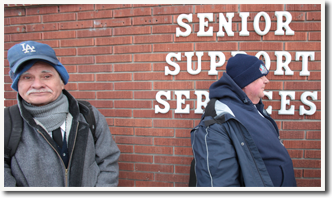 Our overall goal each year is to meet the full range of needs of more than 2,400 hungry and homeless seniors. Access to computers and Internet for word processing, email, etc. Leading Care Coordination in complex client situations. Weekly visits by outreach worker who had 406 encounters with clients regarding SNAP, Old Age Pension, AND, Medicaid issues, rent or deposit assistance, and other financial matters. Monthly visits by a nurse who provided inoculations, foot care, health screenings and checkups. Licensed Professional Counselor provided 379 onsite, individual mental health or substance use counseling sessions for 116 seniors. If you would like a copy of our latest Form 990, please contact us.